Fourteen-year-old Catherine de’ Medici arrives in Marseilles to marry Henry, Duke of Orleans, second son of the King of France. The brokenhearted Catherine has left her true love in Italy, forced into trading her future happiness for marriage into the French royal family. Amid the glittering fÊtes and banquets of the most immoral court in sixteenth-century Europe, the reluctant bride becomes a passionate but unwanted wife. Humiliated and unloved, Catherine spies on Henry and his lover, the infamous Diane de Poitiers. 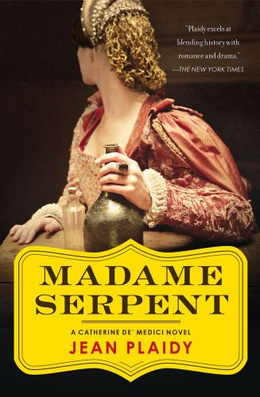 Tortured by what she sees, Catherine becomes consumed by a ruthless ambition destined to make her the most despised woman in France: the dream that one day the French crown will be worn by a Medici heir. . . .
Madame Serpent is the first book of a trilogy about Catherine de Medici. This opening novel begins with Catherine's childhood and her subsequent political marriage to Henry, Duke of Orleans, who later became King Henry II of France. Catherine’s story is one about coming of age and of the court machinations that formed her into the devious woman she was forced to become. Ignored by her husband who prefers Diane de Poitiers, his much older, more experienced mistress, over his wife, Catherine forms a strong bond with her father-in-law, King Francis I. Author Jean Plaidy delves deep into the malice and indignities Catherine suffered throughout her childhood and into adulthood, which ultimately shaped not only her character, but her destiny. Her unrequited love for her husband, Henry, makes the reader sympathetic with her character. She suffers much humiliation and mistreatment not only by her husband, but by her husband’s mistress who usurps her authority at every opportunity. So who is Madame Serpent? Is it Catherine or is it Diane? The answer is up to the reader to decide. It is this conflict that appears on every page of this novel and that kept me turning pages to read more about this fascinating woman. Author Jean Plaidy knows how to write a book that draws readers immediately and indelibly into the story, making her characters feel as real as life. The prose is flowing and invisible, with plenty of descriptions as to gowns, food, and décor of the time. By far, this is the best novel I have read about Catherine de Medici and am eager to read the second and third books of the trilogy. For fans of this famous queen, this is a must have for your book shelf. Beautiful, Beautiful, Beautiful...no other words to describe this post and your blog. Poor Marie. I always wonder if her interest in the occult didn't separate her further from her husband; is this ever addressed? If he preferred Diane, was it because she was French and and fun? Marie was a fish out of water in France.